The emergency braking system Active Brake Assist 4 (ABA 4) is being introduced in the bus and coach sector for the first time ever on board the S 531 DT. In addition to the previously available functions – maximum full-stop braking in response to stationary objects and obstacles moving ahead of the vehicle – it now also incorporates pedestrian detection with automatic braking response. Another world premiere in the bus and coach segment is the use of Sideguard Assist on board the new double decker. This employs radar sensors to monitor the lane to the right of the bus along the vehicle's entire length. When turning off and cornering, it warns the driver of pedestrians, cyclists and stationary obstacles in the turning path. Outside of built-up areas, it additionally serves as a lane-changing assistant. Aerodynamics provide the basis for record-breaking fuel consumption, which drops by around seven to ten percent compared to the predecessor model. New options include wheelchair bays, installations for bistro buses, a demountable platform with pram area for inter-city lines or, with platform, the classic seating for touring purposes. 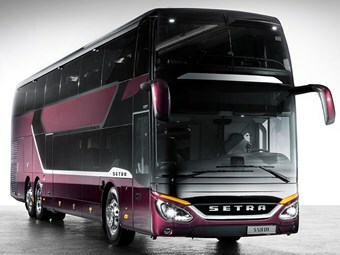 Customers can choose between the cockpit from the Setra ComfortClass 500, or the luxurious cockpit from the TopClass 500. Evenly spaced two-tone steps with individual lighting, landings and continuous handrails give passengers security when going up and down the stairs and the bathroom has been totally redesigned in 2017.